Fish has long been touted as a health food, full of protein and beneficial fats but actually it is one of the most contaminated foods on the planet. 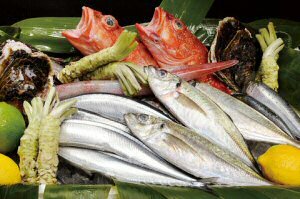 Fish kills more people from food poisoning than any other food source! Think about all the chemicals and farm pesticides and herbicides that are washed into the rivers and into the sea by the rain, not to mention the human excrement that is flushed out into the ocean. Many countries around the world still pump virtually untreated sewage out into their waters and not surpringly fish then feed on it. Sound healthy? Fish are not programmed to filter food, to sort all kinds of micro-organisms out from each other so all those harmful substances are all right there in their bodies. And think about this - fish eat each other. 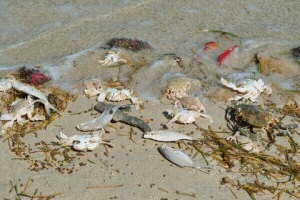 Those non-biodegradable toxins are passed to the next fish, so toxins are going up and up and up, the bigger the fish. Plankton, where it all starts out, are living in the sea which is already highly polluted with chemical waste... it is then eaten by a little fish... then that fish is eaten by a bigger fish... and this goes on until the fish gets big enough for human consumption. Platonium and Mercury has been found in the sea, and both have been found in fish. The mercury issue really makes it clear - the larger the fish, the worse the contamination - shark, swordfish, marlin & tuna all have high mercury content and should be avoided. The seriousness of the mercury issue is just coming to light really. Fish are now sadly, due to widespread pollution, one of the worst sources of mercury and human poisoning with it. The UK Food standards agency now recommends that pregnant women, and women breast-feeding should avoid shark, swordfish and marlin altogether, and seriously limit tuna intake. Even salmon are contaminated with Polychlorinated Biphenyls (PCB) and dioxins (Science magazine 2004). PCBs belong to a broad family of man-made organic chemicals known as chlorinated hydrocarbons. Once in the environment, PCBs do not readily break down and are taken up into the bodies of small organisms and fish. PCB is linked to: cancer; disruption of the human reproductive system, including fetal brain development; and damage of the nervous system. So while fish now carries a government health warning for children and pregnant women due to the toxic pollutants it contains it is at the same time being widely promoted as the best source of omega-3 fats. There's so much hype these days about fish oils that no wonder people feel confused. It's true the human body needs essential fatty acids (EFAs) but the propaganda being pushed by the industries that insist fish is necessary to good health is misleading. Omega oils from fish are unbalanced. The omega oils from flax seed or hemp seed however are balanced and don't come with all the health risks that fish does! Other great plant-based sources are rapeseed oil, olive oil, avocado, nuts and green leafy vegetables so a well balanced healthy diet should already contain enough of the good fats that you need. Fish oils are also an anti-coagulant (which stops blood from clotting correctly) which could be why Eskimos often die young from brain hemorrhages - it is thought their brains bleed because of the fish oils they are constantly ingesting. It has been discovered also that Eskimos have the worst recorded osteoporosis on the planet. Blood plasma is 7.35, slightly alkaline. All animal protein is acidic. Calcium stores held within the bones are released to nuetralise the higher acidity. Tests have shown that after eating an animal protein meal, excessive protein is excreted through the urine. But plant protein is not acidic, it is alkaline, so it does not lower the ph level. It actually protects you from Osteoporosis. Osteoporosis is not caused by a lack of calcium in your diet, it is caused by the calcium depleters in your diet. All animal proteins, including fish, are calcium depleters. In a recent study, children aged seven in the Faroe Islands of Scotland, where large amounts of mercury-laden fish is eaten regularly, had an area of the brain that didn't work properly. And by the time they were fourteen it has worsened. In autopsies done on humans who died of Alzheimers disease, raised levels of mercury have been common. Other research is also linking Alheimers disease to mercury. Contrary to popular belief, all fish and shellfish also contain cholesterol. Prawns, for example, contain four times as much cholesterol as a rump steak. And despite its promotion as a good source of unsaturated 'healthy' fats, much of the fat found in oily fish is saturated. Grilled salmon, for example, contains as much saturated fat as a chicken drumstick. Fish is not a health food. It is acidic to your body and contains no fibre. The essential fatty acids found in fish are not the only source, nor are they the best. They contain saturated fat, are loaded with toxic pollutants known to damage health and no-one knows the long term effects of being exposed constantly to these chemicals. Our hearts don't need fish, our brains certainly don't and our health is far better served by plant-based alternatives. So, if you care about your body, stop listening to the marketing deception, let your thinking evolve and eradicate fish from your diet today!